I made a visit to the US 90 Biloxi to Ocean Springs bridge site on Thursday and was able to observe the driving of one of the indicator piles. This is a 30-inch precast prestressed concrete pile that will also be used for a Statnamic lateral load test. The axial and lateral load tests will begin later this month, with production piles planned to start in mid-September. The left photo shows the barge set up for driving. This pile was adjacent to the bascule span of the destroyed bridge. 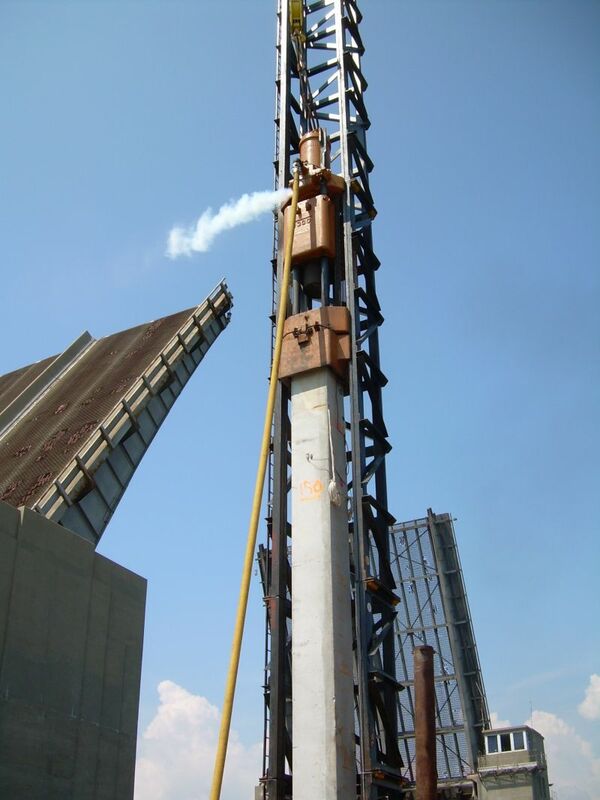 The middle and right photos are during pile driving. A air hammer is being used to drive the pile. 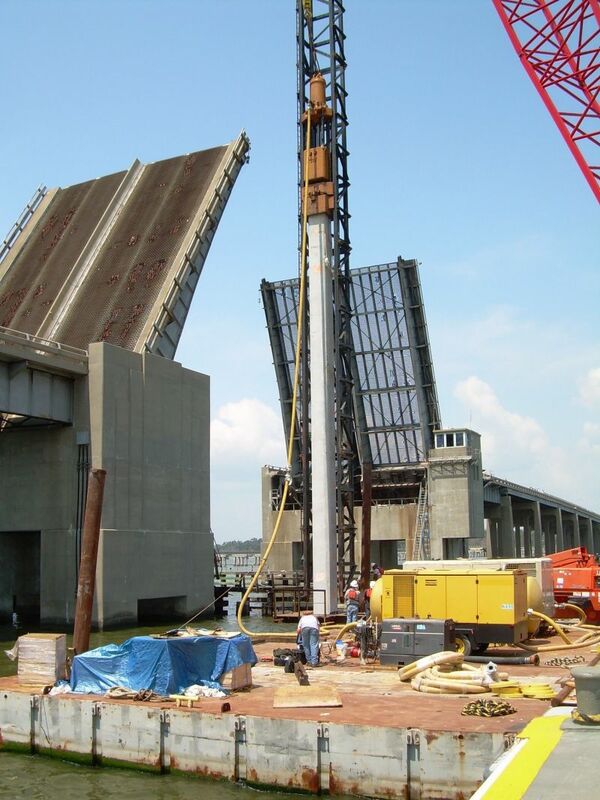 DBAâ€™s work on the John James Audubon Bridge in Louisiana continues to move forward.Â We have submitted our reports for the main river piers that include the recommended designs for post-grouted drilled shafts.Â Test shaft construction is scheduled for late August or early September for an Osterberg Cell (O-Cell) load test. Driving of indicator piles has begun at the US 90 Bridge from Biloxi to Ocean Springs, Mississippi.Â A program of 21 indicator piles and 6 load tests (4 axial and 2 lateral) will be used to develop pile capacities and driving criteria for the project.Â Eustis Engineering, Inc. is monitoring all indicator and test piles using the Pile Driving Analyzer (PDA).Â The load tests will be performed using the Statnamic device in late August. We have postedÂ our papers from the DFI amsterdam conference.Â Go to the post on the conference below and click the links to the papers, or go to the Publications Page of our site. 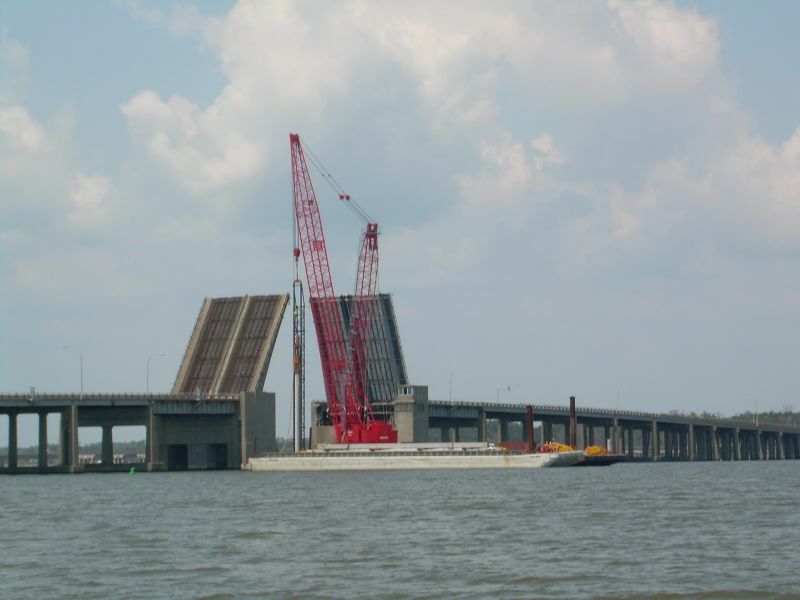 DBA is working with the design-build team selected to re-construct the US 90 bridge between Biloxi and Ocean Springs, Mississippi. GC Constructors, AJV was awarded the project and is a joint venture of Massman Construction Company, Kiewit Southern, and Traylor Brothers, Inc. The geotechnical engineer for the project is Eustis Engineering of Metairie, LA. DBA will be consulting on pile foundation design and testing with Eustis and Parsons Transportation Group, the bridge designer. 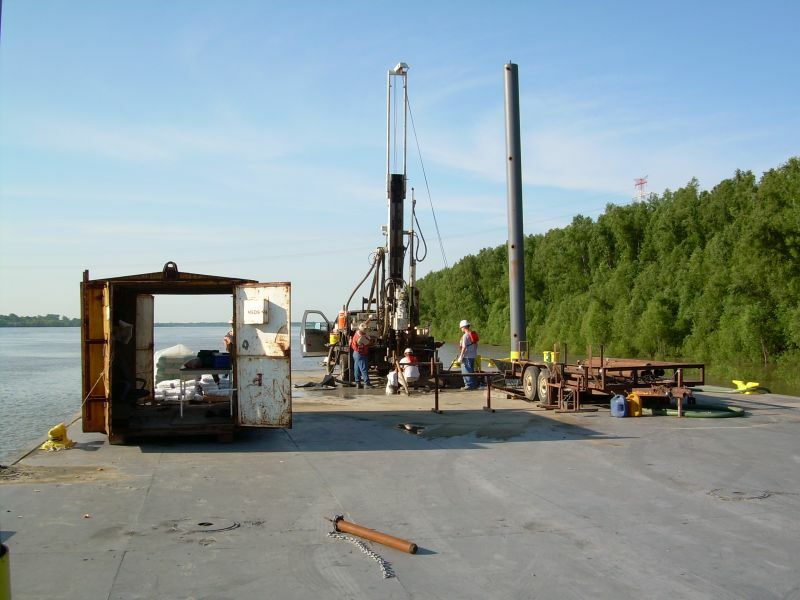 Exploratory soil drilling has begun for the John James Audubon Bridge near St. Francisville, LA. PSI is performing the drilling while I observe. The crew completed the borings for the West Pier on May 23rd. They will move to the East Pier after Memorial Day. A picture of the crew is on the left below, one of the samples of clay brought up from about 270 feet below the river bottom is on the right. near St. Francisville, LA. is performing the drilling while I observe. The crew completed the borings for the West Pier on May 23rd. They will move to the East Pier after Memorial Day. A picture of the crew is on the left below, one of the samples of clay brought up from about 270 feet below the river bottom is on the right.near St. Francisville, LA. is performing the drilling while I observe. The crew completed the borings for the West Pier on May 23rd. They will move to the East Pier after Memorial Day. A picture of the crew is on the left below, one of the samples of clay brought up from about 270 feet below the river bottom is on the right. DBA is part of the design-build team that is the apparent successful proposer for the longest cable-stayed bridge in North America: the new Mississippi River Bridge connecting New Roads and St. Francisville, Louisiana.Â The bridge will formally be known as the John James Audubon Bridge and is the Louisiana DOTDâ€™s first design-build project.Â The team we are on is Audubon Bridge Constructors Joint Venture, a joint venture of Flatiron Construction, Granite Construction and Parsons Transportation Group.Â DBA will be the geotechnical engineer of record for the planned 8-foot diameter post-grouted drilled shafts that will support the main span towers and the high-level approaches.Â Â Work on the project is expected to start in April.Â We’ll post more information and links later as the project moves forward. ADSC Drilled Shaft Design and Construction Short Course- March 22-23, 2006 â€“ Philadelphia, PA.
Dr .Dan Brown, P.E. and Dr. Bill Isenhower, P.E. of ENSOFT, Inc. will be conducting a two-day short course on Drilled Shaft Design, Construction and Testing. 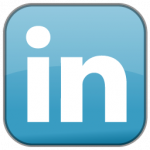 The course is the second in a series produced by ADSC and ENSOFT, Inc. 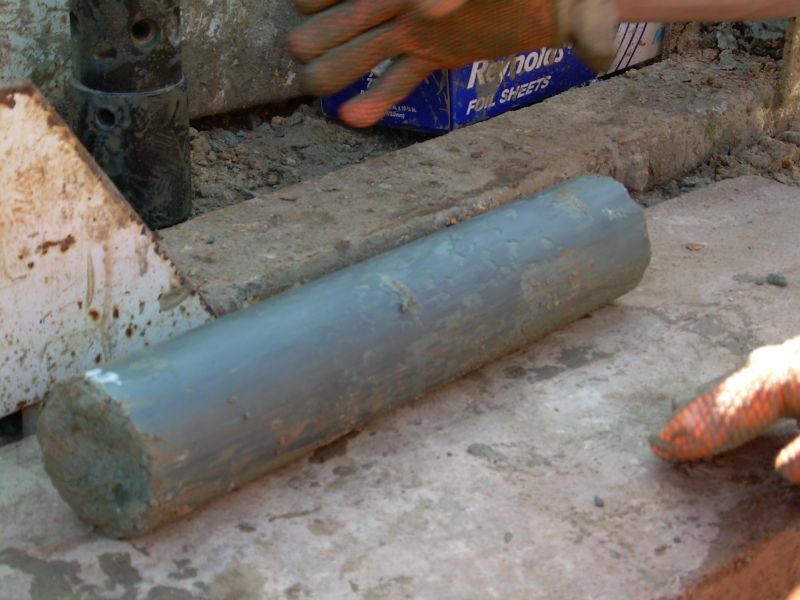 The program will cover drilled shaft design, specifications, QA and QC testing, and recommended construction procedures. 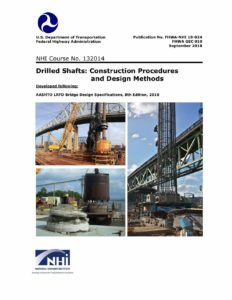 This course is modeled on the highly successful NHI course that has been provided to state DOTs and is based on the FHWA Drilled Shaft Design and Construction Manual developed by Dr. Michael Oâ€™Neill. The course is being sponsored by the ADSCâ€™s Mid-Atlantic Chapter. Registration information can be found at www.adsc-iafd.com. Dr. Dan Brown and Dr. Steve Dapp will be presenting at the PDCA 10th Anniversary Annual Conference at the Hilton Palacio Del Rio in San Antonio, Texas March 2 â€“ 4, 2006. 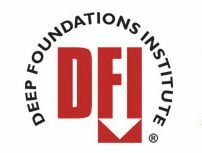 Dan will be presenting â€œPile Set Up in Foundation Designâ€ on Friday the 3rd. 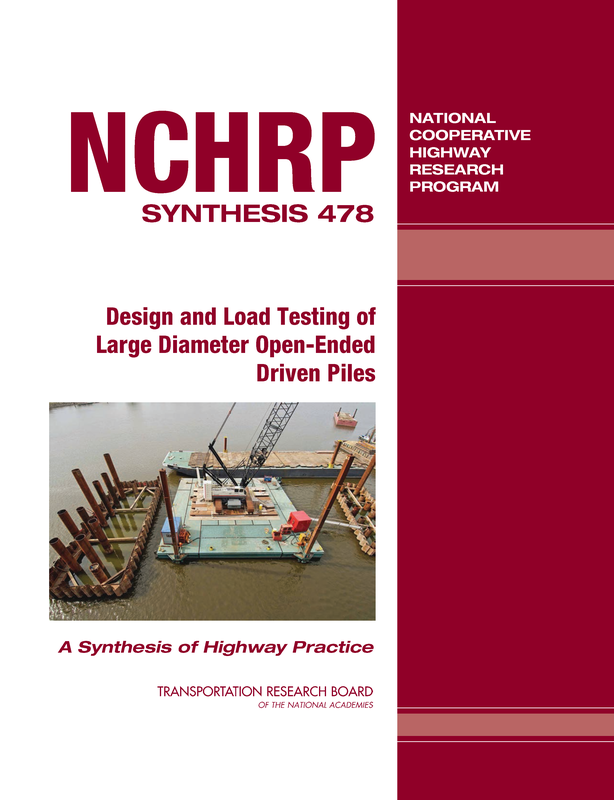 Danâ€™s presentation will provide an overview of the fundamental mechanisms affecting the time-dependency of axial resistance in driven piles, and the effect of this phenomenon on design, quality control, and testing of driven pile foundations. Examples from the ongoing Escambia Bay Bridge project will be described, in which setup has been seen to vary considerably based on soil conditions. Dan will also be a panelist in a roundtable discussion â€œComparing Driven Pile Capacities With Drilled Shaft Capacitiesâ€ to be held later that afternoon. On Saturday the 4th, Steve will present â€œStatic and Axial Capacity Between Drilled and Driven Pilesâ€. Steveâ€™s presentation will provide an overview of the effect of construction on deep foundation behavior and factors that affect performance. Issues of construction quality assurance and control, along with advantages and limitations of each foundation type will also be discussed.